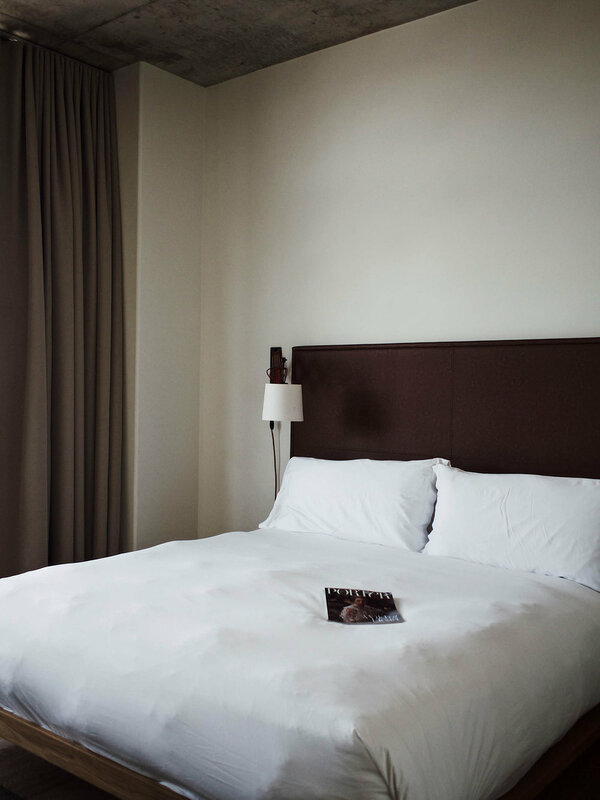 Last year before my trip to Montauk, I stayed a night at the Boro Hotel and instantly fell head over heels for its simplistic style that features rustic, urban touches. I loved my stay at the Boro because it boasted so many unique elements around every corner, from the views to the modern finishes and little details. The Boro stood out from my other stays in the city because it had interesting aspects in every corner that I could appreciate, from contemporary tiles, cool textures and really incredible lighting fixtures. By staying there I felt like I was fully immersed in the ultra-chic New York lifestyle and experience. Initially, what grabbed me were the views of the city. From every corner of my room, I had the perfect view overlooking the Manhattan skyline. As I woke up to the sunrise I found myself wanting to lounge around all day and catch up on my reads in the luxurious oversized bed with the most delicious almond milk latte delivered to my door from the quaint little café downstairs. When I needed to cool down and unwind from the heat of the bustling city I stepped into the roomy overhead shower and emerged refreshed with cool, dewy skin and damp hair. Afterward, as I watched the sunset over the skyline, I was reminded of why I love summer in the city and since my stay at The Boro, this destination quickly became one of my favorite places to stay in New York; it was magical and truly breathtaking!